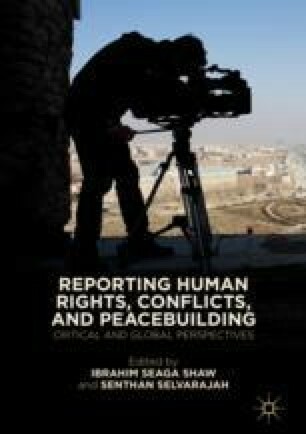 The introductory chapter provides an overview of the main argument of the book which calls for focus on the human rights-oriented reporting of conflicts rather than a simple objective presentation of facts. The editors emphasise the necessity for strengthening Track II Diplomatic Activities locally and internationally by extending activities undertaken by media researchers and research institutions in their construction of discourse on “Human Rights and Peace”, beyond academia. They call for the media research institutions to undertake research, training and knowledge management activities in coordination with other Non-Governmental Organisations, including the UN, which undertakes Track II Diplomatic Activities, and translate their research into action-oriented projects. The editors claim that this volume is a meeting ground of ideas and approaches in the form of research papers that identify areas of convergence of media, human rights and conflicts within a just peace framework. Robinson, P. (2013, September 17). Media as a Driving Force in International Politics: The CNN Effect and Related Debates. E-International Relations. Retrieved May 28, 2018, from http://www.e-ir.info/2013/09/17/media-as-a-driving-force-in-international-politics-the-cnn-effect-and-related-debates/.